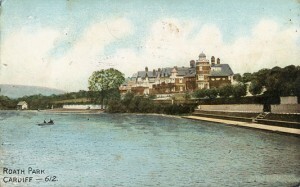 Roath Park Lake was formed by the construction of a dam (which became the Lake Embankment and now the Promenade) across the Roath Valley and Nant Fawr brook. It was filled with water in December 1893 and varied in depth between two feet and more than fourteen feet. 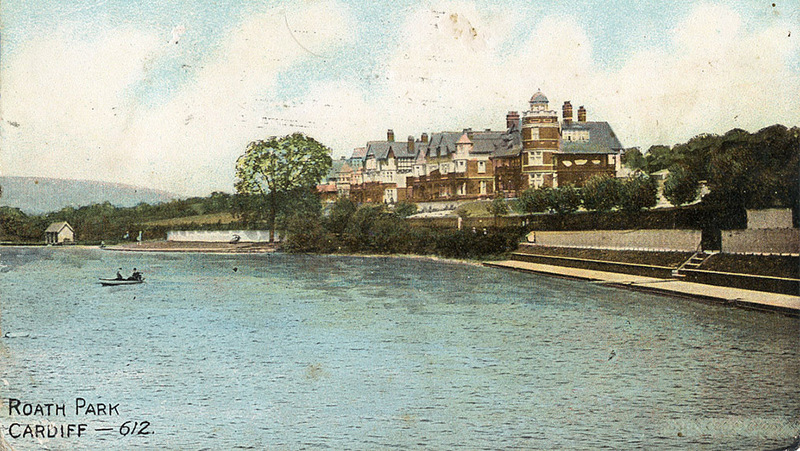 Bathing in the lake was a highly popular activity from the opening of Roath Park in June 1894. The Western Mail of July 2nd that year published a letter from a resident describing a “splendid swim” in the lake at 6 o’clock in the morning with another 50 people already also in the water. Bathing, for men and boys only, was permitted from 6.00 a.m. to 9.00 a.m. daily including Sundays. A “swimming expert” was employed from the outset and patrolled the lake in a punt. The justification for this was shown within in the first month, when a young man drowned while swimming in the lake, despite the efforts of the swimming expert. From 1897 to 1905 the “swimming expert” was Ivor Samuel Stephenson. Also known as Sammy the Boatman, he continued to supervise bathing until his retirement in 1928, having been in the Council’s employment for 31 years. The Parks Superintendent, William Pettigrew, reported each year on the number of people who used the lake for bathing. From 1896, when there were 10,481, the numbers climbed steadily, though they could fluctuate considerably according to the weather. For the 1906 season Pettigrew reported that the total number of bathers was 48,294, and the greatest number on a single day was 2,050 on September 2nd. This peak so late in the year coincided with an intense heat-wave affecting all parts of the UK, with temperatures exceeding 32 °C (90 °F) on four consecutive days from August 31st to September 3rd. In the early years there was no space or shelter provided for bathers to change and leave their clothes, but a bathing stage was constructed on the eastern bank for the season starting 1st May 1900. There was also a diving board, which was shown on the 1901 Ordnance Survey map. The bathing stage still gave no shelter for bathers while changing their clothes. Consequently the Parks Committee meeting of 29th July 1901, as reported in the Western Mail, was told that “Roath Park bathers have been offending the susceptibilities of early morning cyclists” who wrote to the Committee complaining that they “could not ride past the park without enduring objectionable sights”. Although the Parks Superintendent said that he had visited the the Park “time after time, and had seen nothing objectionable”, he was instructed to obtain canvas to create a screen. This evidently did not satisfy the complaints because in March 1905 the Superintendent was instructed by the Parks Committee “in the interests of decency”, to purchase 100 laurel shrubs to plant at the rear of the bathing stage to provide a screen. The postcard below, from the early 1900s (the postmark is indecipherable, but it has an Edward VII stamp), shows the bathing stage with the canvas screen. There were discussions over a number of years about widening the bathing stage and building “dressing boxes”, plans for which were finally approved in 1908. By September of that year 63 dressing boxes were completed and available for use, along with a turnstile to charge for entry. They proved popular, in that by the 7th October, 2,179 bathers had paid the penny charge to use a dressing box. In July 1910, 32 additional boxes were completed, making a total of 95. The steady popularity led to the introduction of evening bathing in 1909. A report in the South Wales District News of 14th August 1909 by “A Regular Bather” stated that, “Throughout the day-time there are generally a goodly number of bathers, and this is especially the case in the afternoons, when the scene is one of great animation and crowds of interested onlookers throng the promenade. But the great rush is in the evenings after 6.30, when would be bathers literally swarm round the turnstiles, and the accommodation provided by the bathing boxes is utterly inadequate.” The writer also reported that bathers were drawn from all sections of society and from as far away as Whitchurch and Canton, resulting in rows of bicycles ranged along the footpath near the turnstile. Until 1911 only men and boys were permitted to bathe in the lake, but mixed bathing was introduced in June of that year, and some of the boxes were screened off for use by ladies, with a separate entrance at the north end. Male bathers were forbidden to land on the section of the bathing stage in front of the ladies’ boxes and vice versa. In the spring of 1924 the stage was extended to the north with 30 new boxes, all for the use of ladies, and seating was provided for spectators at the south end. Charges by this time were 2d each for use of the bathing stage, bathing costume and towel. During the summer of 1928 there was an outbreak of dermatitis among bathers, the cause of which was traced to a parasite infecting a certain snail present in large numbers in the lake. It was decided to use very dilute copper sulphate solution to destroy the hosts of the parasites without harm to other life in the lake. This was successful and bathing was resumed, but City Treasurer’s Accounts for the period showed that expenditure regularly exceeding income from bathing. This postcard , with a 1940 postmark, shows the bathing stage with its full complement of dressing boxes. 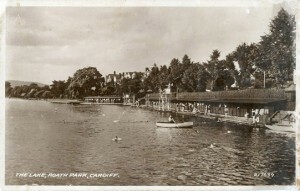 The Taff Swim was held at Roath Park Lake from 1931 to 1961. Said by the Welsh Amateur Swimming Association to be the greatest Welsh swimming event of the year, it was first held in the River Taff in 1924, starting near the Castle and going down to Clarence Bridge. In 1931, the reconstruction of the bridge caused the event to be moved to Roath Park Lake, where it was still called the Taff Swim and still attracted a huge carnival atmosphere. In 1948 bathing was again interrupted by a “repetition of insect nuisance” (as reported in Council Minutes). After chemical treatment the lake was re-opened to bathers but closed again in 1949, when concerns about the impurity of the water returned. The Medical Officer of Health reported on samples taken from the lake successively from 1951 to 1955 and gave his opinion that the lake was still unfit for bathing. Bathing was therefore permanently discontinued with the exception of the Taff Swim. In the early 1950s there was some talk of converting a portion of the lake to form a separate swimming pool with chlorinated water, but the City Surveyor recommended the construction of a swimming pool at the north end of the Roath Park Recreation Ground as a better solution. The cost of this was estimated at £15,000 and it was not pursued because a proposal for a central swimming pool for the City was by now under consideration.